Possibilities are endless! 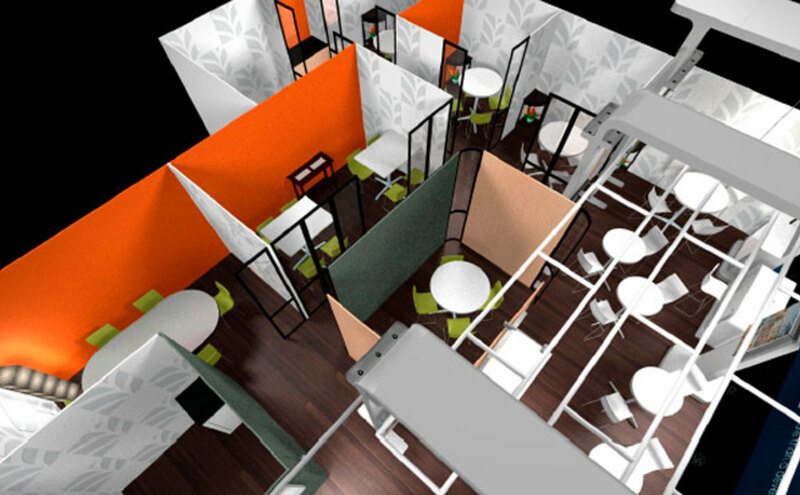 We have the ability to design custom environments that reflect your company’s brand and personality. 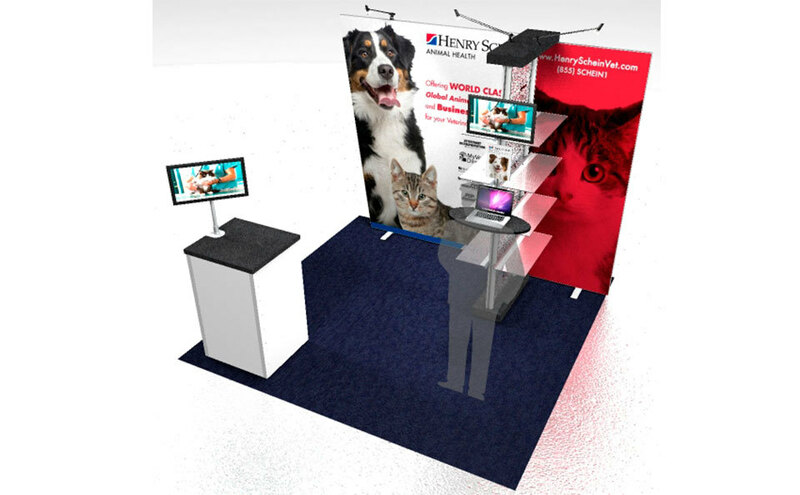 Whether we provide a solution for your exhibit with a simple tabletop or create a double deck exhibit system, we can design, build and install the entire project. A Partnership for more than a century. 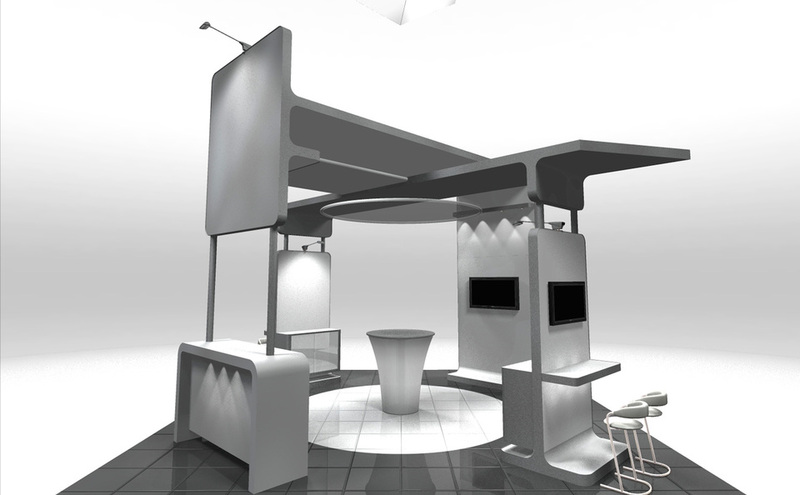 We first met with The Butler Company in 2006 when we learned they were in the market to purchase a large inline exhibit. 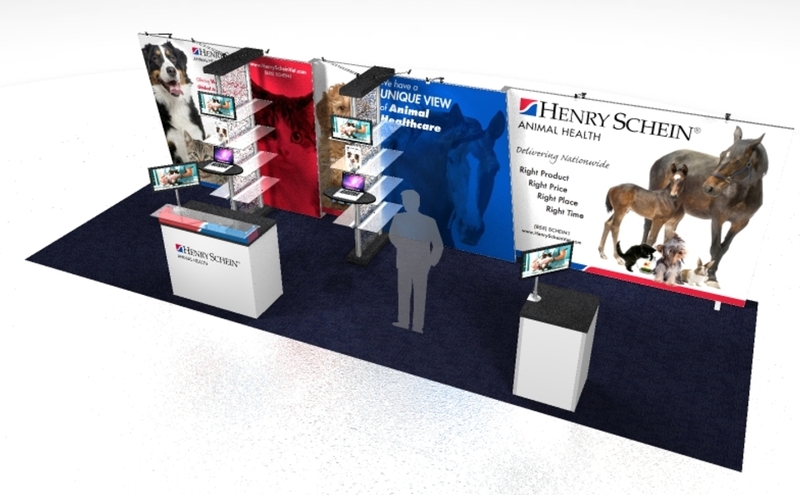 After meeting with the company and asking many questions in our consultative approach, we moved forward with the design of a 10’x60’ inline exhibit. 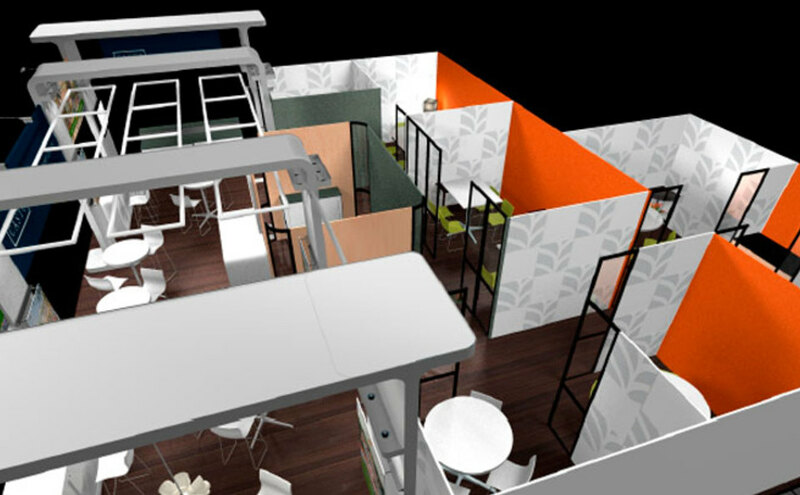 • Extreme configurability – The Butler Company wanted the exhibit to configure to almost any size booth space from 10’x10’ to 10’x60’. -In addition, the exhibit would have to be able to be reversible – for example, a 10’x40’ inline would go from left to right at one show and then from right to left at the next. 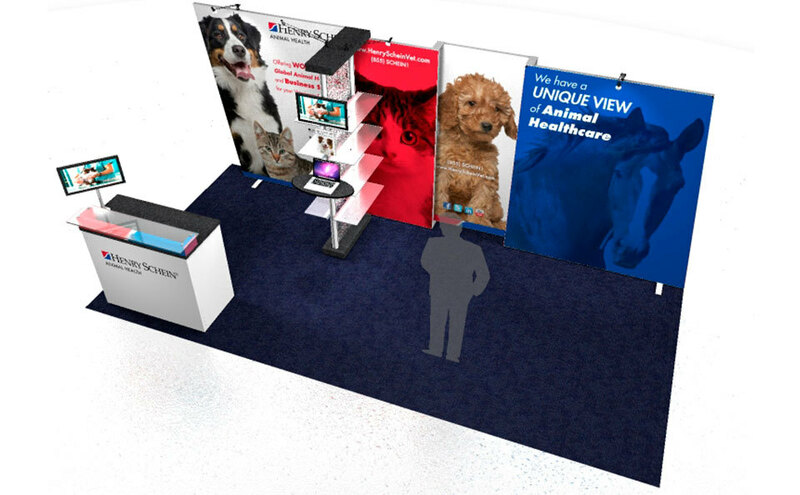 • We were asked to design the exhibit with as much space as possible in front of the exhibit so the client could bring lots of product samples into the booth space. • The graphics needed to be interchangeable. • The exhibit was required to support the weight and mount at least three 42” monitors. • Lots of counter space was needed. 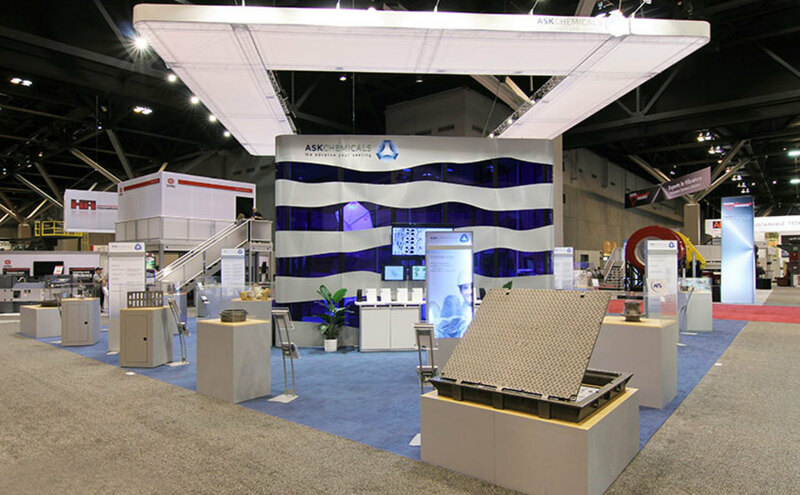 Our design solution was a 10’x60’ panel type exhibit system where all the panels, counters and graphics were very flexible so all the configurability requirements could be met. 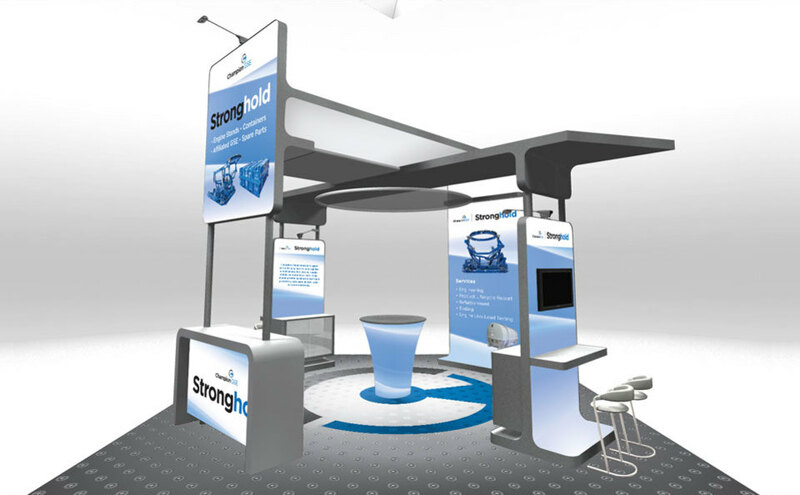 A long 10’x60’ inline exhibit was unique even at that time but the design was both attractive and very functional at the same time and the client loved it. The Butler Company was true to their goals and over the next 5 years, they used the exhibit in any number of possible sizes and reverse configurations. We generated 10 different sets of installation instructions for our service teams! 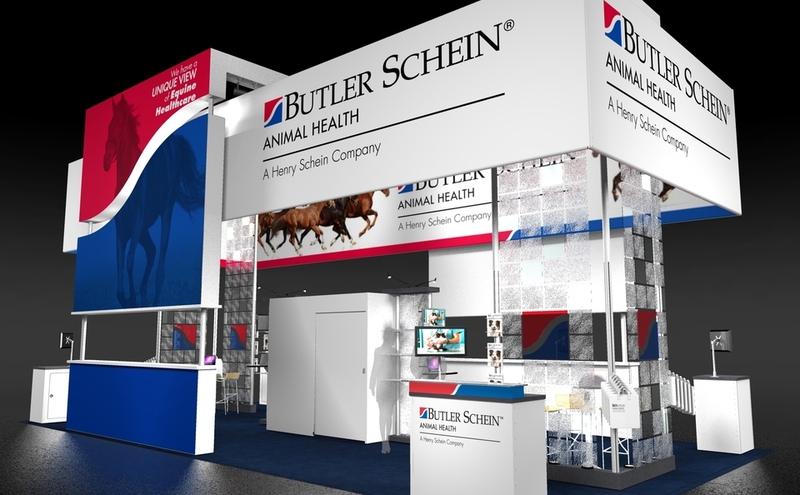 The Butler Company was acquired by Henry Schein in 2010 and purchased a new 20’x30’ exhibit in 2011 in one of the largest sales in Skyline Exhibits of Central Ohio’s history. 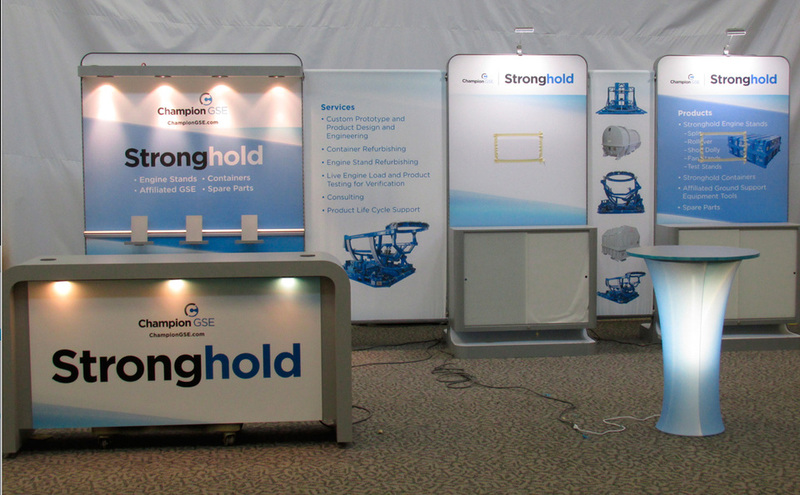 The customer continues to exhibit at 10-20 shows per year with exhibits ranging from 10’x10’ to 20’x30’ and also uses small banner stands for many events. They have been part of our Exhibit Management Program since 2006. Fall season. Opportunities to sell to other divisions or areas of the company? Henry Schein has referred us to Kruuse, a Denmark company who they recently acquired. We now service their exhibit on and the show floor and they are part of our Asset Management Program. What encompasses nearly 20’x20’ and can support the colossal heft of an aircraft engine? One thing’s for sure - not something that can be hauled in and displayed at a tradeshow. SECO’s longtime partner, TricomB2B (Dayton, Ohio), winner of numerous American Advertising Federation awards and a B2B Magazine Top 150 agency, brought Champion’s exhibit challenge to us. 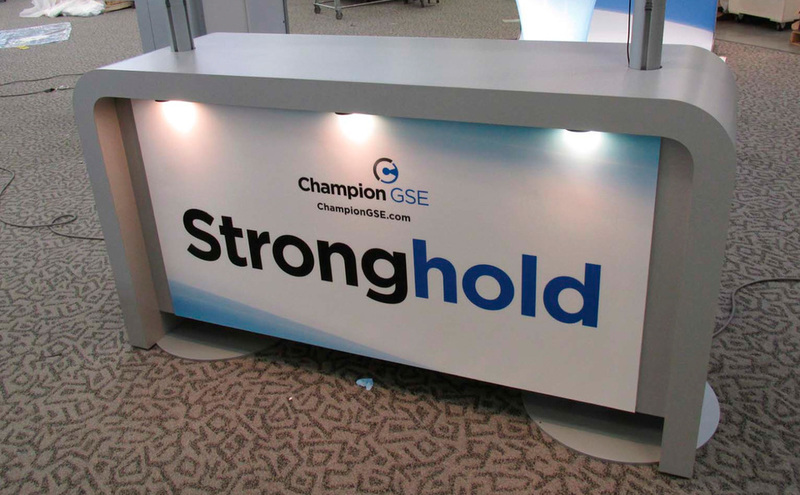 Champion’s exhibit needed to seduce show traffic in without the benefit of product to show; to function as an information center; to reflect Champion’s impressive standing as an exceptional quality company with sleek, modern design. Skyline Designer, Tom Mersman, transformed a single, hour long discovery session into a first pass that Champion loved at first sight. Resembling a 747 and constructed with the modular Envoy system and stunning fabric graphics, the structure elegantly encircles without enclosing and packs down to surprisingly few cases. The exhibit design features a staged, video-presentation area visible to show traffic, complete with a light-shield canopy, as well as four greeter stations. 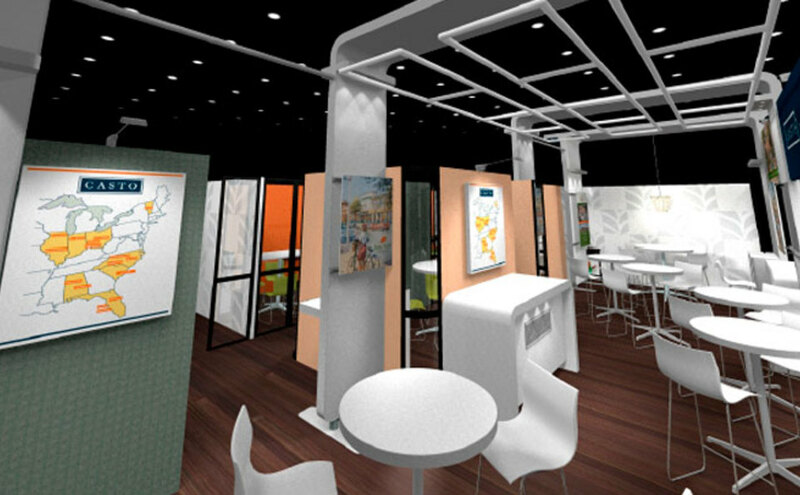 And when 20x20 is too much booth, Champion can reconfigure their exhibit to a 10 x 20. For a real estate development company whose expertise lies in perfecting alluring spaces, an exhibit deemed “the place to be” would seem the ultimate trade show triumph. Casto seemed to achieve that kind of prominence at a recent show thanks to attention paid to design detail – those finishing touches that can seem trifling but often come together to make a memorable, striking statement. Our first opportunity to work with Casto came as a mission to simply focus on those “details”. 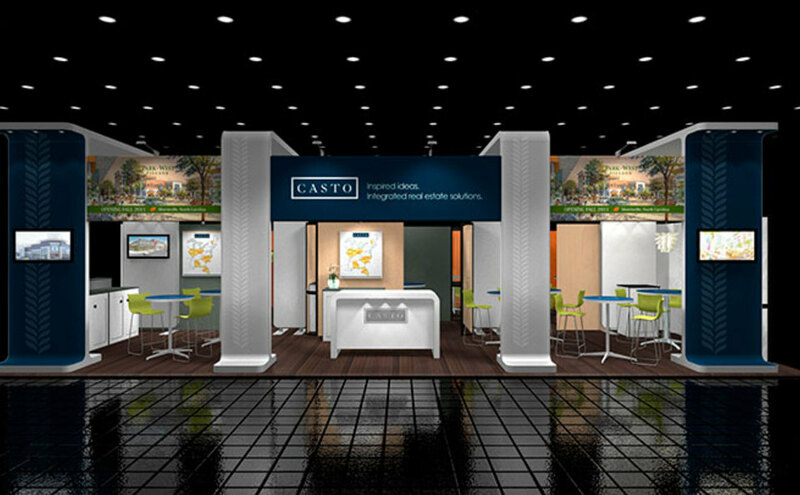 (It was a leap of faith for Casto to work with our team as they had maintained a longstanding relationship with another trade show company.) As it happened, they crossed paths with a Skyline rep who took to heart Casto’s desire to re-dress their existing exhibit with a variety of unusual, captivating graphics. She aimed to astound – she took the task personally. Our graphic guru dazzled Casto with a wild, cutting-edge collection of graphic gate crashers: finest fabrics, custom mounts and things a cling has never before clung to! Some years later, Casto gave Skyline the chance to find a new island exhibit home for their vast graphic collection. In keeping with Casto’s belief that the graphics make the ultimate statement and impression, they chose a graphic-rich Envoy structure to replicate a mod real estate office. Graphics were featured everywhere, of course - from panels to walls to the very tops of tables. Said a Casto employee, the booth was recently described as, “the place to be” by one impressed show-goer. A first foray into the world of exhibiting can be a little intimidating. The paperwork alone can be paralyzing! But this is where Skyline shines. We understand all these moving parts and enjoy guiding our clients through each step to a successful show from beginning to end. 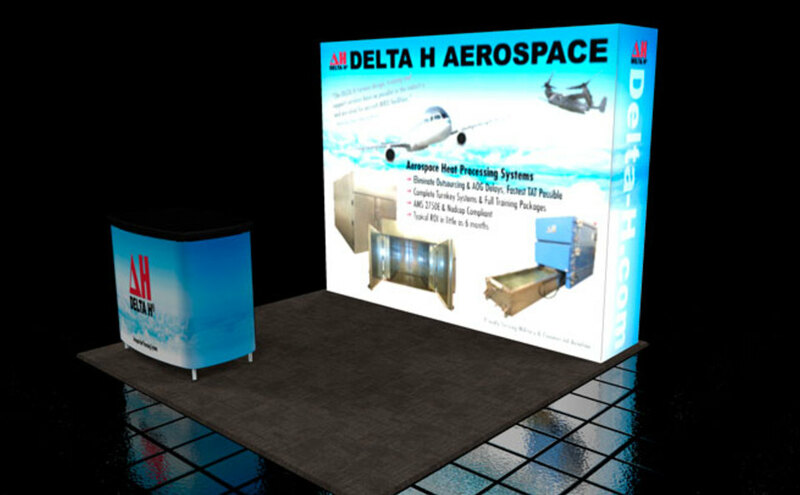 Delta H was like many newcomers to the trade show experience: A highly reputable company that needed to stand-out and impress on a limited budget. With only two months prior to show, our consultants presented rental options and designed graphics for a knockout 10x10 display, featuring the brilliant backlit PictureCube. With design phase completed, show deadlines fast approaching and an intimidating pile of paperwork left to do, our team went ahead and submitted the forms on behalf of our brave first-timers to make sure all the “T’s were crossed and I’s were dotted”. And then it was time to deliver the exhibit…through an untimely winter storm. Slowed down by snow, the exhibit was delivered to the show venue at the eleventh hour but Skyline was prepared with an installation crew at the ready to help set it up. Alas, a trade show story would not be complete without a little extra excitement… in one day, Skyline reproduced and sent out a graphic that had turned up missing at installation so that it arrived to the exhibit by the second show day. Understanding that the exhibit itself and trade show experience were so new to Delta H, and to be sure that the show ended smoothly, Skyline was on-hand to help dismantle and pack the display for a safe maiden voyage home. 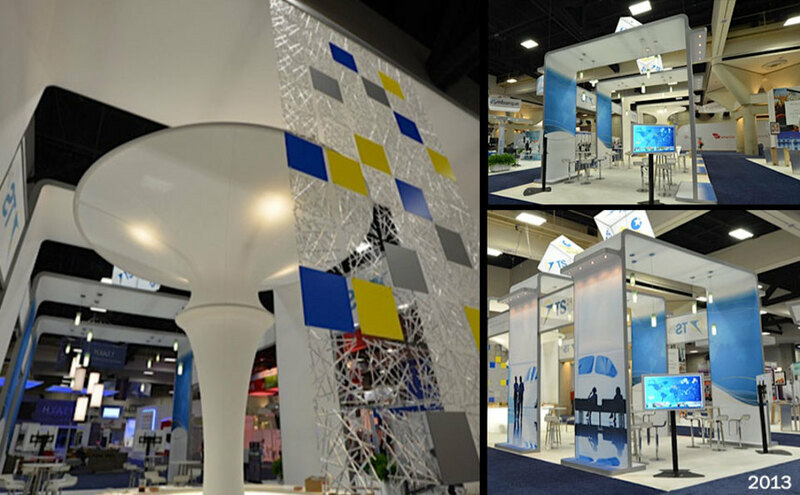 At the western hemisphere’s largest trade show for metalcasting, ASK Chemicals relied on Skyline to manage every detail related to its 50’ x 50’ booth space – exhibit design and production, shipping, installation and more. A competitive process turned into a “no-brainer”, Charlie Hoertz, Marketing Manager of ASK Chemicals said, because “Skyline offered more services at a lower cost.” That freed Hoertz to concentrate on marketing activities instead of logistics. 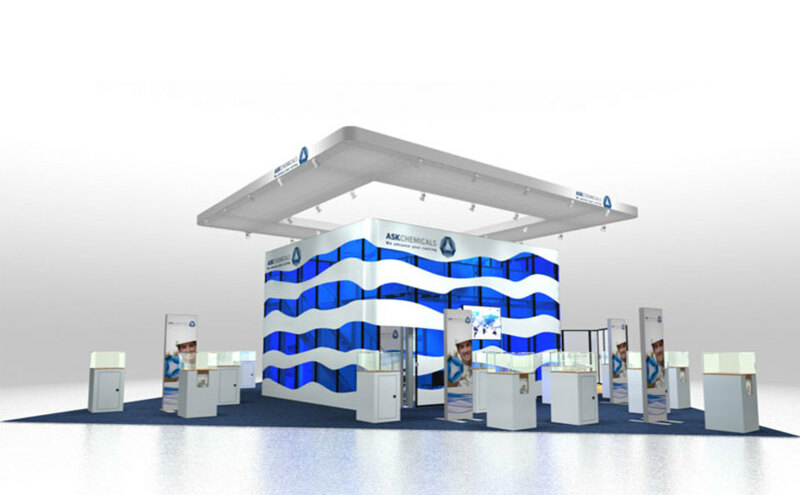 Given a design concept and corporate standards written in German, Skyline converted the wish list into a custom modular exhibit featuring a 35’ x 35’ hanging structure for can’t-miss visibility over a 20’ x 20’ main structure. Backlit stands with double-sided graphics promoted six product areas. Kiosks explained the custom solution behind the customer success story in 15 castings on display cases. 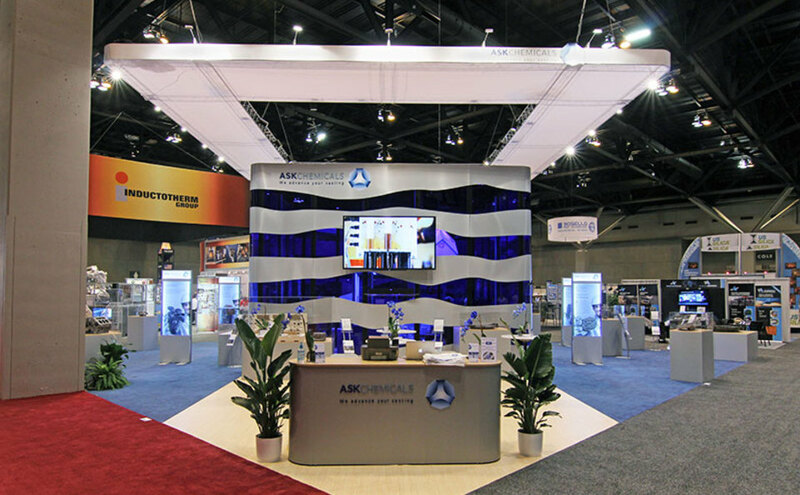 Without sacrificing sophistication and flair, ASK saved money by renting exhibit hardware to supplement its purchase of frame components and custom graphics. 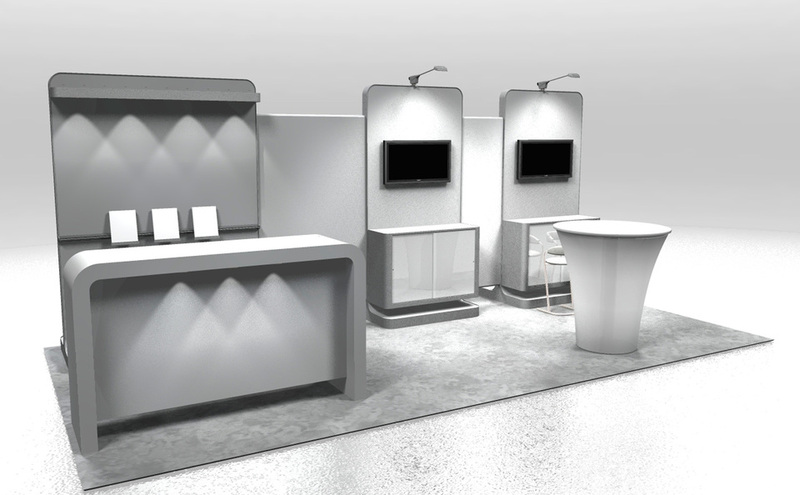 And with a modular collection, the exhibit is easily reconfigured for smaller shows. The Columbus Convention and Visitors Bureau just changed their name to Experience Columbus in 2002 when we made contact with the VP of Marketing to inquire about their trade show strategy. 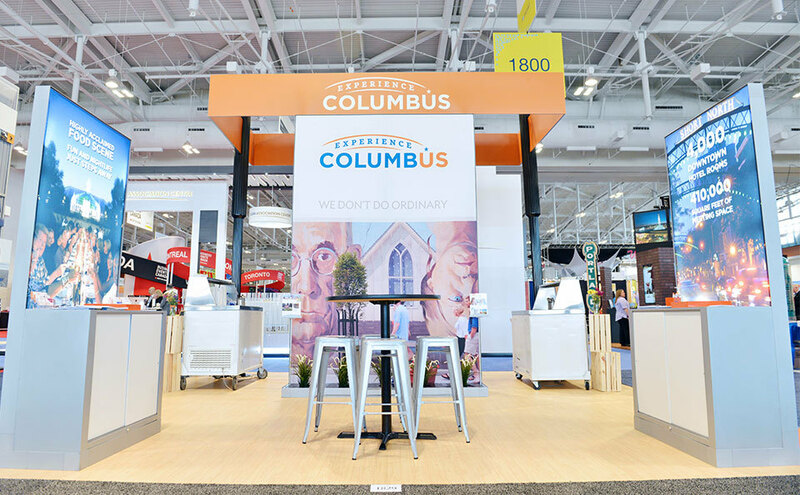 With the new branding and name change, we discovered Experience Columbus was developing a new trade show marketing strategy and investing in a new trade show exhibit as well. The VP of Marketing for Experience Columbus explained several goals for their new 20’x20’ exhibit: lots of space to accommodate their booth staffers, attractive graphics that could be seen from inside and outside the exhibit, tables for discussions with show attendees visiting the booth, incorporating their new logo and organization branding and creating a map showing all the major hotels and areas of the City. Skyline Exhibits of Central Ohio worked closely with our manufacturer to design and price an exhibit that would meet all these criteria. 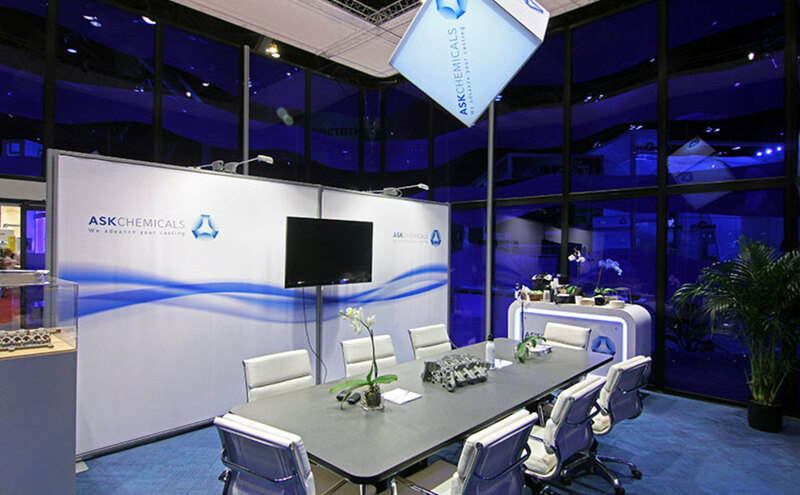 Experience Columbus loved our cutting edge design with the open format, round fabric ring graphics inside and out, 3D logo graphic, info graphics which could be read on the inside and outside of the booth, small conversation tables and centrally located Map Table! We even found a way to keep their existing carpet and incorporated it into our design. 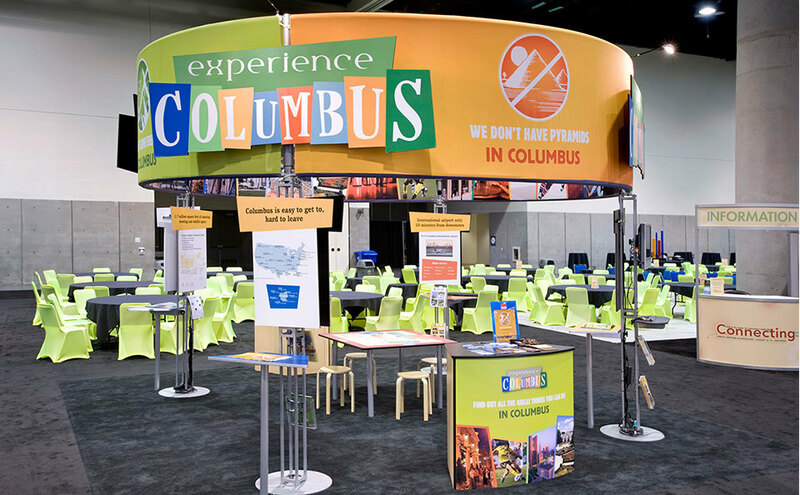 To meet Experience Columbus’ budget but still give them a terrific look, Skyline Exhibits of Central Ohio rented the exhibit hardware and sold the graphics. Experience Columbus would go on to use this exhibit or a variation of it with new graphics at their large trade show the next 5 years. Over the years, Experience Columbus became a close trade show marketing partner with Skyline Exhibits of Central Ohio by purchasing or renting large 20’x20’ exhibits every year for their annual industry show and buying many small exhibits which are used in 10’x20’, 10’x10’, and table top booth spaces as well as for special events. 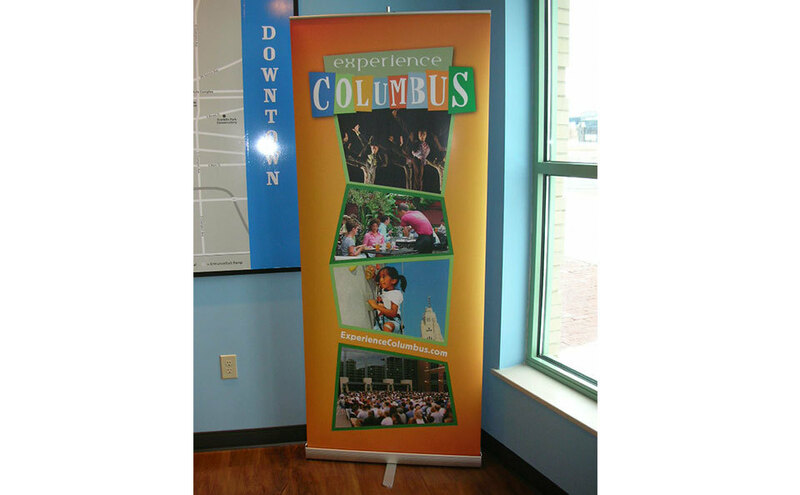 Experience Columbus has been in the Exhibit Management Program since 2010. 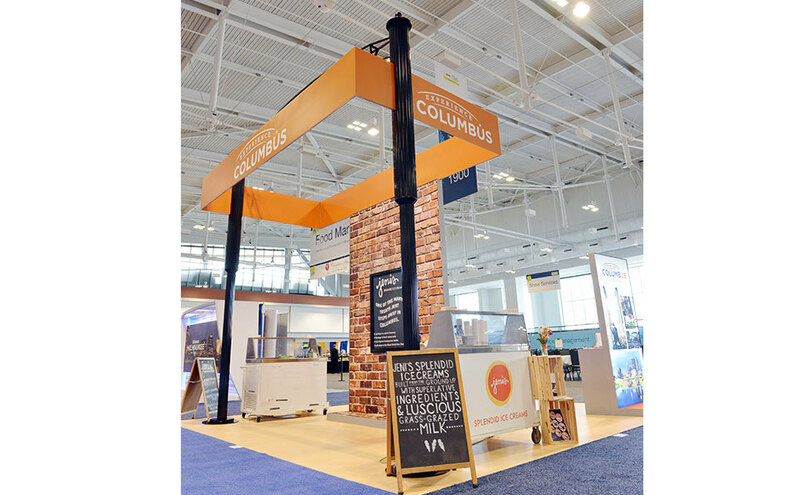 This year, Experience Columbus continues to exhibit at many small shows throughout the year, purchased a new 10’x20’ exhibit used twice a year and is exhibiting in their major August industry show with a newly designed 20’x20’ booth! Skyline Exhibits of Central Ohio was introduced to Mac Tools during an initial meeting with one of our Marketing Consultants in 2006. During the meeting, we targeted that the existing solutions they had been sourcing through their show decorator were not providing them with the impact and function that they desired. Through a series of subsequent discovery meetings, we were able impress upon them that the Skyline team could address their needs within their budget. 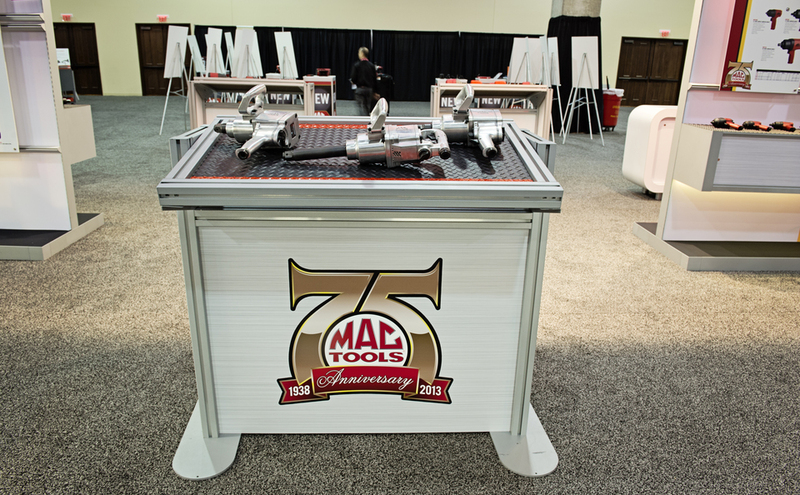 The Mac Tools Tool Fair is a 3-day event where the company hosts thousands of North American distributors with the goal of providing new product introduction, training, networking, recognition, prizes and entertainment. 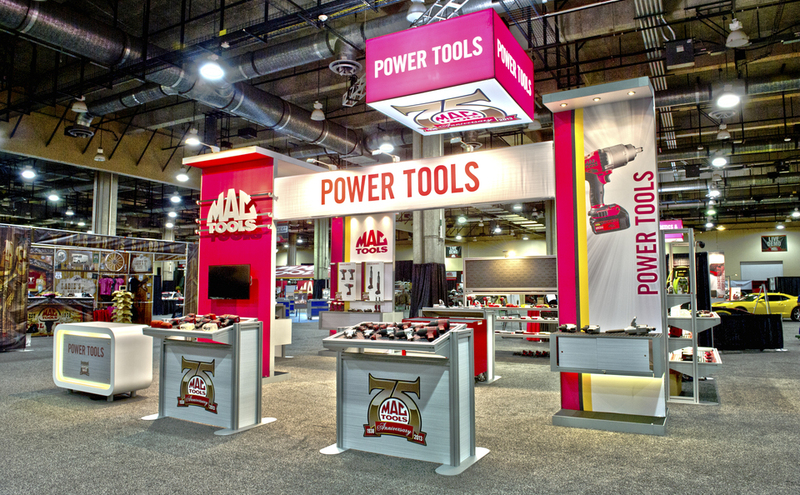 The Tool Fair is held in a different city in the U.S. each year. 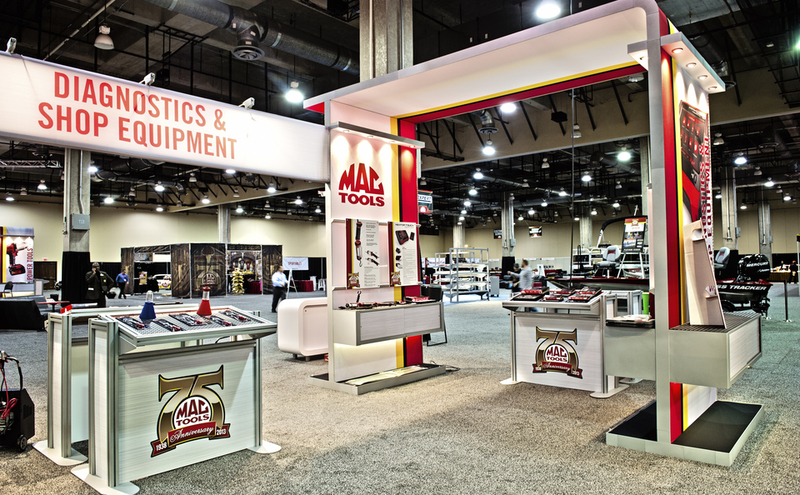 Mac Tools expressed a need to rent (4) 30’x30’ environments, creating zones for each product category. The main challenge would be timing of installation: All (4) large exhibits must be set up in one day, a requirement dictated by date of permission into exhibit hall and the Mac Tools product teams’ need for merchandising time. Essentially it’s a race against time the minute the crates arrive on show floor. 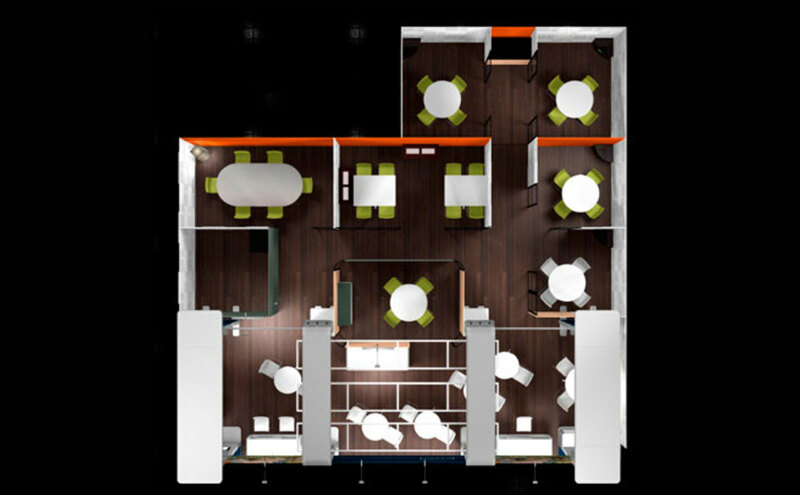 • We were meticulous in planning critical details so all components of installing (4) large exhibits in one space in one day could be completed without any issues. Mission accomplished! 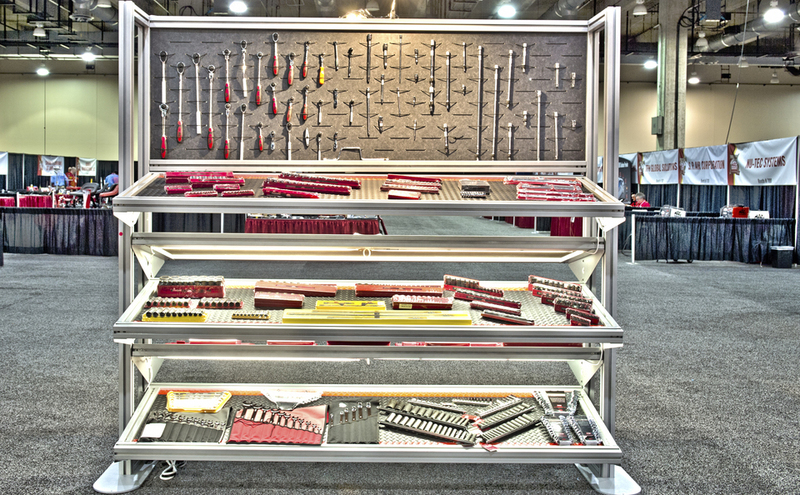 Since the first Mac Tools exhibit rental at their 2007 Tool Fair, we have provided a variety of rental solutions with complete installation/ dismantle services throughout the United States at every Tool Fair through 2016. The Mac Tools team has been very satisfied with our attention to detail and remarkable customer service. 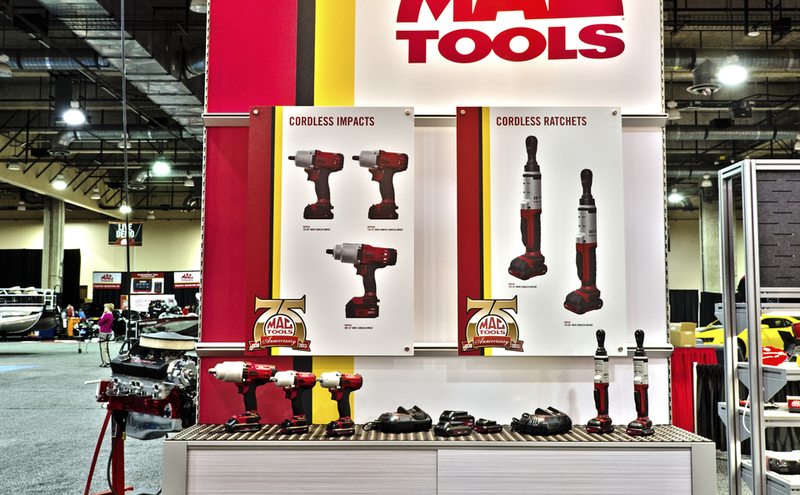 Mac Tools has been in our Exhibit Rental Program since 2007.
design capability and services that we have established with the local Mac Tools team over the past 10 years. 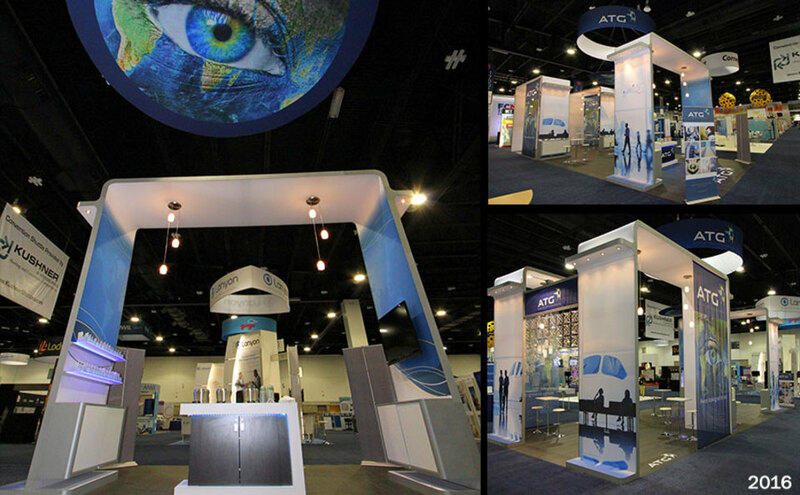 ATG is the exhibitor who is a global business travel management company who needed a presence in a 20x50 exhibit space. TS24 was a first time exhibitor who wanted to establish their brand at GBTA. 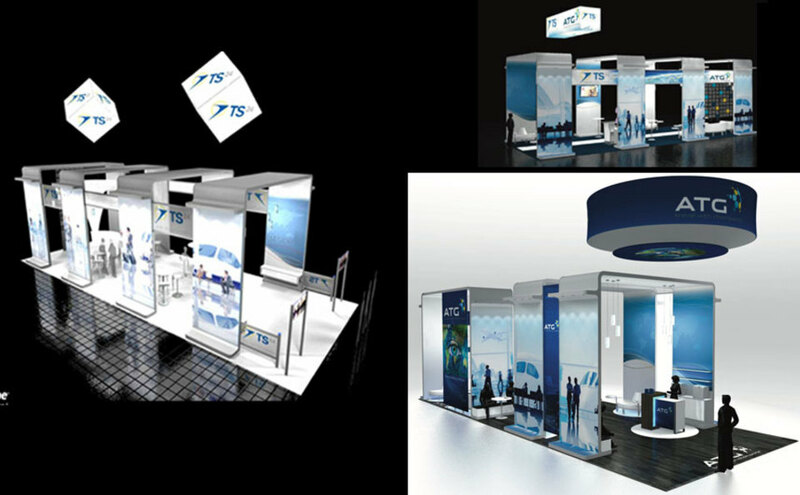 We designed an exhibit presence where attendees could meet and talk with TS24 staffers, backlit PictureCubes hung from the ceiling, a funnel glow bar with German beer and promotional steins was placed into the space, and touchscreens introduced attendees to TS24 presence and website. All components were rental. 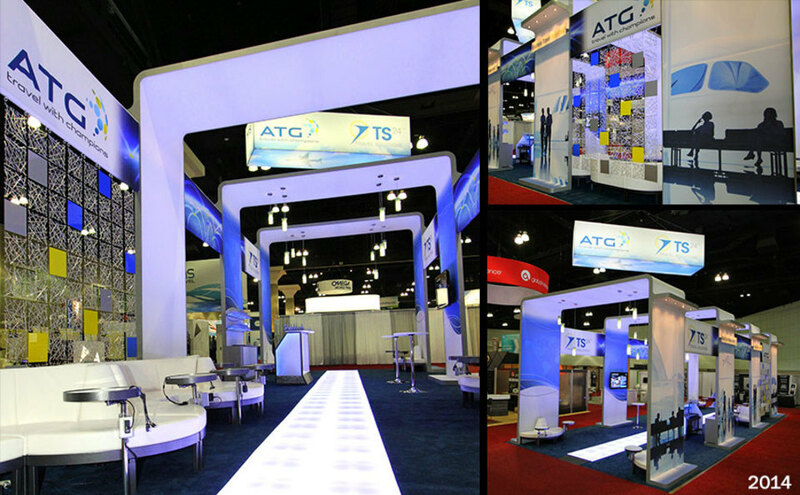 We used the same structure, but with a larger backlit rotating hanging sign with their old TS24 and new ATG logos. Underlit charging furniture was used in the space for casual meetings, a monitor ran a promotional video, a glow runway ran the length of the exhibit, which illuminated the path into the space. 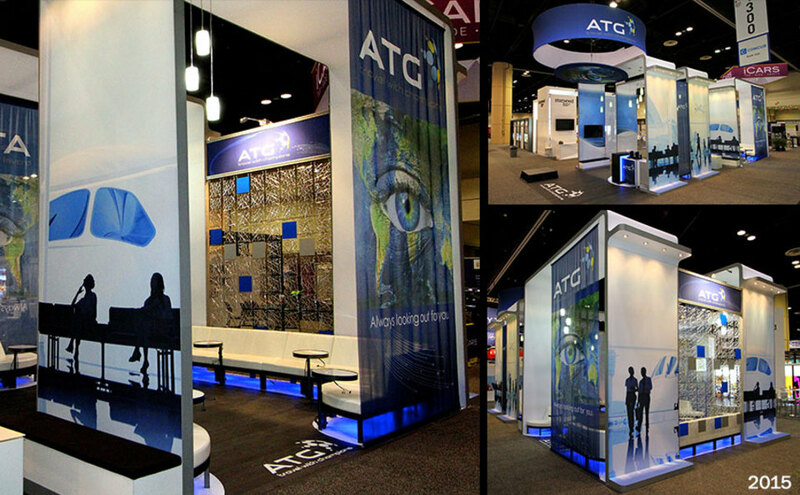 Graphics were added to introduce the ATG branding. In addition, ATG hosted a bar for attendees. Now they are fully branded ATG and wanted the back of the space to be more enclosed, so we turned half the of the structure so it was more defined, and added large sheer banners. A large round rotating sign with a second tier of graphic was also added. A monitor ran their social media feed and a video. 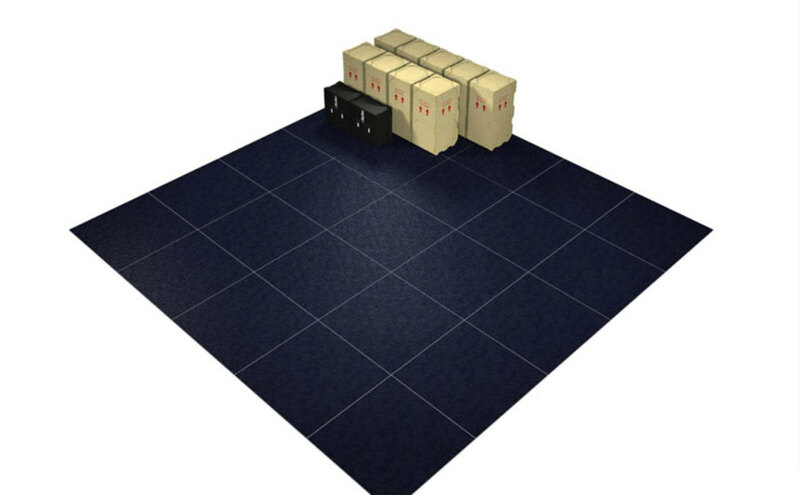 A black vinyl floor was added with vinyl cutouts to reflect the underlit furniture. A hostess station with a cappuccino was added for attendees. To lower costs and open the space more, we removed an arch, added cabinets for storage and reconfigured the kozial tiles at the back of the space to create an entry point and so staffers could ride a hoverboard around, as that was one of their giveaways. Fresh fruited water was available at the hostess station for attendees. 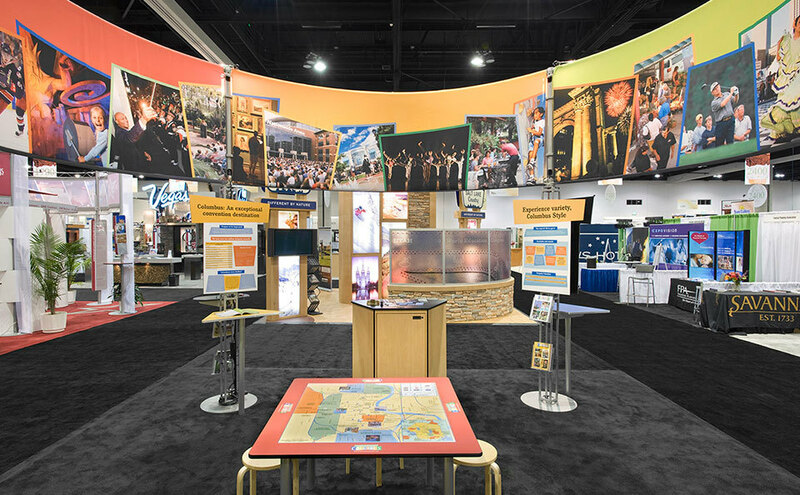 Partnering with Skyline and using a rental custom modular rental exhibit allowed ATG to transition and rebrand their company over the course of 4 years, while easily re-configuring their exhibit to be used for their required exhibit activities at GBTA.